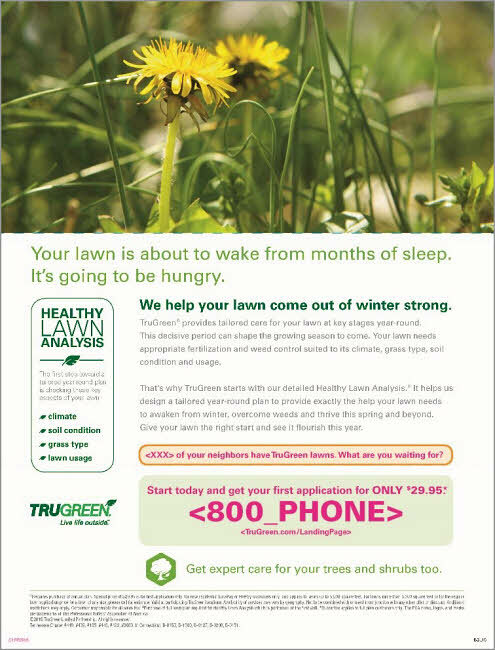 SUMMARY: TruGreen, a lawn care company spanning across the United States and Canada, sends more than 100 million pieces of direct mail annually during the spring and summer months. Reaching customers while saving resources is a key goal at this volume. By integrating email, segmenting customers and streamlining the overall process, the marketing team managed to save more than $800,000 in postage and reduced its direct mail production time by 35%. Around for over 40 years, TruGreen is America's #1 lawn care company focusing on lawn care, fertilization, weed control, tree and shrub care and a series of other expanded services, such as aeration and lawn-damaging insect control. TruGreen changed its branding approach last year, and along with that "our number one goal … is to get people to live life outside, so that they can enjoy a green, beautiful, lush lawn for all of their backyard barbecues and kids' birthday parties and things like that," Jennifer Brereton, Senior Brand Marketing Manager, TruGreen, said. A lot of people, according to Brereton, have seen lawn care in the past as a commodity and more of a functional need. "So our biggest challenge and opportunity was to take that functional need as a competitive difference and make that into more of an emotional need for people," she said. Along that line, in all of TruGreen's imagery, instead of it being more focused on the danger of weeds and more fear-based marketing, the marketing team decided to focus on families and people enjoying life outside on their lawns. "We basically took our campaign from 'we kill your weeds' to 'love your lawn,'" she said, explaining that they've taken the marketing message from "more from a functional need to an emotional need of why you want to have that pretty, green, lush lawn that we can help you with." TruGreen initially reworked messaging in campaigns to reflect this more positive change, and then began working toward reducing resources needed for the direct mail campaigns while not reducing volume. When Brereton took over the direct marketing campaign for TruGreen, the team knew they needed to make some changes since the creative was old, and they had been using it for several years. "First of all, we knew we needed to send more pieces of mail and obviously, when you think we need to send more pieces, that means you need more budget," she said. The team began working closely with their vendors to redesign a piece that would enable them to send more mail, while not increasing the cost per piece significantly. This reassessment resulted in the creative being changed to focus on the imagery of living life outside, to reflect the new positive message focus. "We used to be more focused on 'Here are the five things we do to help your lawn' and it's now more focused on 'Don't worry about those things, we've got it, live your life outside, we'll take care of the weeds, make your lawn green and pretty,'" she said. "We are very seasonal and weather-dependent, and that's one of our biggest challenges. So when we wanted to send more direct mail pieces, we looked at the buying patterns of the different regions," Brereton said, adding that since TruGreen covers most of the United States and Canada, weather is a differing purchasing factor for most customers. "Sending a piece in Florida, the timing of people buying in Florida is going to be different than the timing of people that are going to be buying in New England. So we looked at buying patterns and took those regions and divvied them up a little more so we weren't sending everyone the same piece at the same time," she said. Because of this, the team was able to capitalize on some of those year-round markets, and more closely align the direct mail with the observed buying patterns in those different regions. "Once we did that, we also looked at the weather impact here every year, to look at the normalized weather trend and try to space the mail over our peak season," she said. To mitigate the risk of putting all of their direct mail eggs in the peak season, they decided to not just mail in April or May, but spread out direct mailing to about four or five times throughout the year. Brereton explained that if a customer lives in Florida, the first contact is probably going to be in January and TruGreen will probably mail them through July, so they are able to extend the market for those areas with year-round needs. Whereas in the Northeast, they probably wouldn't start mailing until March, when the snow starts melting. "We were able to divvy up the mail a little bit. Because we used to have a one-size-fits-all approach, and obviously the consumers these days don't think like that ... we wanted to make sure that we're not wasting mail mailing into a snowstorm," she said. This works out well if there is an unforeseen weather event, as well, she explained. "If I send mail into Boston and there's a huge snowstorm about to hit, one, I try to hold the mail, because I do have a process worked out. But if I can't do that, I know that that person's going to get three or four more contacts and ... if they don't buy then when there's snow hitting, they might buy later on," she said. An additional small change the team made was changing the offer. The previous offer was old, possibly confusing and "not really in tune with what people were used to seeing in the lawn care industry. So our changing the offer helped us tremendously over the last few years," she said. The marketing team is integrating email and direct mail, especially in the "high-yield audience" versions, according to Brereton. The high-yield audience, she explained, includes leads not sold, cancelled customers and new movers. She said that as a customer, "you might get an email, then a direct mail piece, an email, then a direct mail piece. So it gives people a few more other ways to respond to us if they don't want to call an 800 number, they can click on a link on an email and fill out a lead form or call or buy online." The lead process is simplified, she said, with email reflecting what a customer would get through direct mail for continuity. The design is simple as well, she added, with the goal of both being to either get a call or a click. "[The email has] a teaser with a few bullet points to get them to give us a call and learn more. Our direct mail piece is pretty simplified, too. We try not to get too into the details with our direct mail because we have so many different plans and everyone's lawn is different, so we really want them to call so that our call center reps can direct sell them to the plan that best fits their needs," she said. The team also segments for their different high-yield groups, with win backs being the highest responding segment, according to Brereton. "We usually go back three to five years, win backs, to mail them and the messaging's a little bit different, talking about 'come back to TruGreen, we know your lawn because we used to do it before,'" she said. They also have "leads not sold," who are people that called into the call center "but for whatever reason, didn't purchase. They either left us an email address, phone number or we took all their information but we just never heard back from them. So we mail them and they're a really high responding segment," she said. New movers are another key segment, she said, and the team tries to approach this group before any competitors are able to. "We try to hit them pretty quickly as soon as we get the call from our vendor that supplies us with the new mover file. We also mail neighbors, so people that live near our current customers are used to seeing the TruGreen truck at their neighbor's house, because birds of a feather flock together, right? So people that see the TruGreen truck and see their neighbors are using TruGreen are a higher-responding audiences," she said. For efficiency, the content is typically as similar as possible between these groups, but they are able to change copy if it's deemed necessary to speak to directly to these different groups for relevancy. 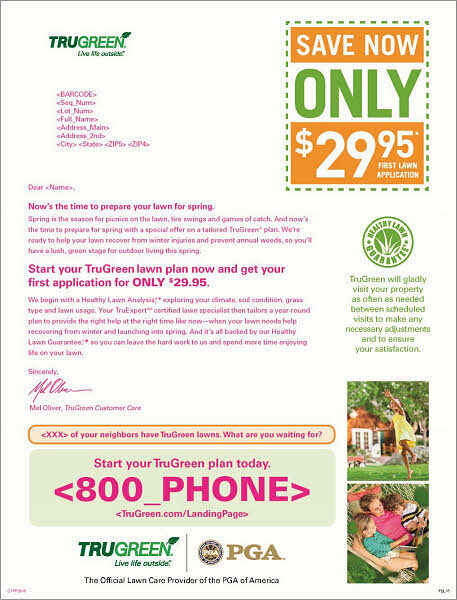 TruGreen reduced direct mail production time by 35% and saved around $800,000 in postage in this campaign. "We've been able to send 52% more mail in the past three years by working through this with our agency and our working on the efficiencies," Brereton said, adding, "We've seen about a 20% reduction in cost per sale, which is every marketer's dream, right?" The team has also seen a 20% increase in their buy rate, and she said practicing segmentation was a key factor in that increase. "A prospect's going to respond differently than someone who's had a relationship with us in the past. So we narrow down who we're mailing and we know how to target them way better now than we did a few years ago," she said. Marketing has gotten so detailed as a result of this campaign, Brereton added, that "we're looking at audience versions, as well. So if we're seeing degradation after three contacts with our win backs, we're not going to mail them five times anymore. 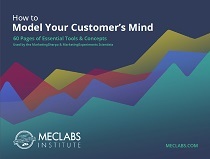 So three might be the magic number, so we … really drilled into that segmentation now that we know that the overall strategy works."